Space Images | Rifting at Hi'iaka Patera, Io? NASA's Galileo spacecraft acquired the images in this mosaic of Hi-iaka Patera (the irregularly shaped, dark depression at the center of the image) and two nearby mountains on November 25, 1999 during its 25th orbit. The sharp peak at the top of the image is about 11 kilometers (about 36,300 feet) high, and the two elongated plateaus to the west and south of the caldera are both about 3.5 kilometers (11,500 feet) high. The ridges on the northwestern mountain are often seen on Ionian mountains and are thought to be formed as surface material slides downslope due to gravity. 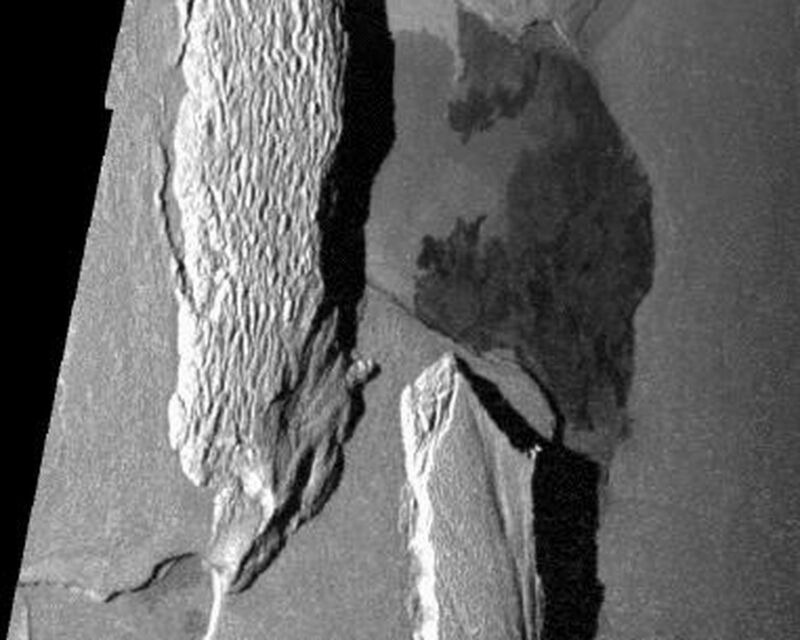 At low resolution, many of the dark features, called pateras, appear to be calderas -- depressions formed by collapse into an empty magma chamber. However, higher resolution images such as this one suggest a different origin. 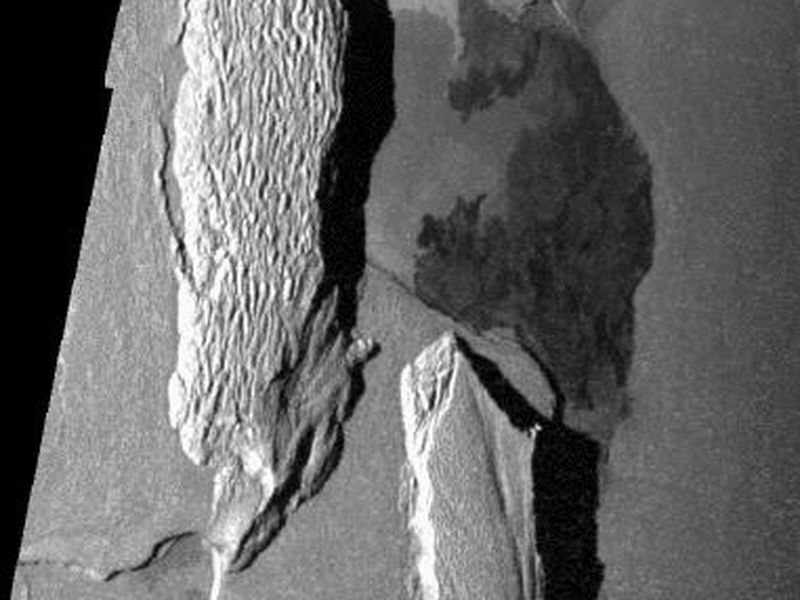 In the case of Hi-iaka, the northern and southern margins of the pateras have very similar shapes which appear to fit together. This may indicate that the crust has been pulled apart here and the resulting depression has subsequently been covered by dark lava flows. Furthermore, the two mountains bordering Hi-iaka Patera also appear to fit together. However, the similar shapes and heights of the pateras margins and mountains could be coincidental. 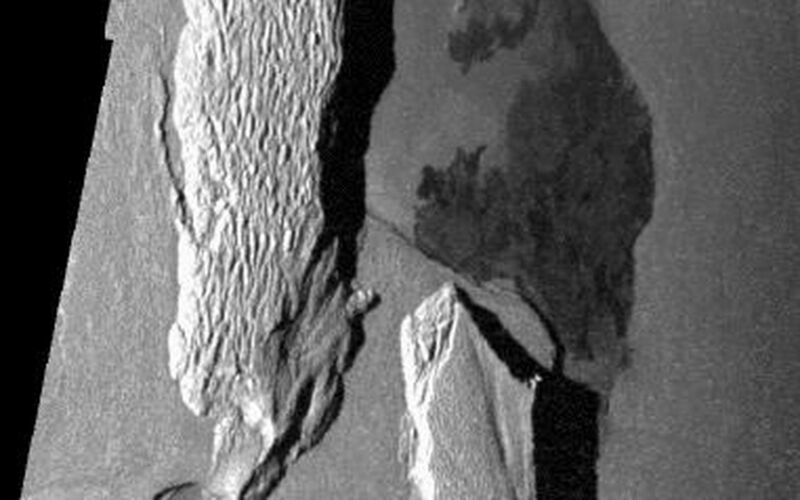 Galileo scientists are currently investigating whether mountains and pateras are related to each other and what could cause the surface of Io to rift apart in such a manner. North is to the top of the mosaic and the sun is illuminating the surface from the left. The resolution is 260 meters (about 280 yards) per picture element. Galileo took the images at a distance of 26,000 kilometers (16,000 miles) from Io. This image and other images and data received from Galileo are posted on the Galileo mission home page at http://solarsystem.nasa.gov/galileo/. Background information and educational context for the images can be found at http://galileo.jpl.nasa.gov/gallery/io.cfm.